Candidates can now buy WAEC VERIFICATION PIN Online Purchase at affordable price from us. Candidates searching for how to buy WAEC VERIFICATION PIN for NYSC online can now reliably get it from us. WAEC VERIFICATION PIN is used to verify or check the age you provided to WAEC during the registration. 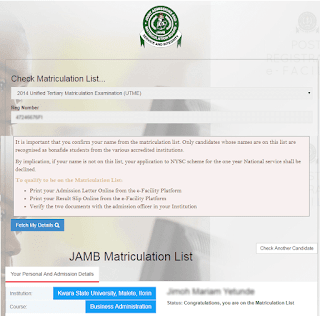 It is mainly used by NYSC Portal to correct or amend wrong date of birth provided either by your Institution or JAMB to the date of birth you used in WAEC - This means that why JAMB or your institution provides NYSC with your date of birth, there might be disagreement in your real age which can be reconcile with the aid of WAEC VERIFICATION PIN. WAEC Verification PIN was initially meant to be sold by FirstBank. Getting it from us means you will not pass through the following challenges normally encounter at banks. 1. Long Queue at the bank. Login with your email and password by clicking on ‘Resume Registration’ link on the NYSC registration portal. Your institution may likely send 1994 to NYSC which means, you’ll be mobilized. If you’ll not want to be mobilize, you can use WAEC Verification PIN to change it. my real date of birth is 1994 but nysc indicates 1993. Is there any need changing it? on my waec certidicate the date of birth is 14, nov 1985 and I graduated on October 19, 2016, any hope for service ? Sir, I have a wrong date of birth in my waec certificate, how do I go about to correct it, I mean the procedure? The date of birth in both my waec certificate and in nysc portal did nt tally to my real date of birth. Does this have any effect on me? I'm yet to complete my nysc form online, how do I go about changing the wrong date of birth. I have two result neco and waec, it was the neco I used to secure admission, in the waec result I did nt pass my English language, and reading from previous comment u can only used ur date of birth in your waec result to effect changes, so. My question is if I used my waec result to effect changes will there be any issue? They will not be any issue if you did, even if you are not using it in school, you can use it for the verification. NYSC only want to confirm that you have such record not the grades in the result. My green card when printed out is showing 1994 while my credential my year of birth is 1993, pls who do I correct it? The person that registered my nysc form put in a wrong date of birth, how do I amend or correct it? The person that register for u nysc did nt.made any error, ur date of birth was pre uploaded from ur jamb info. Get the waec verification pin from us, to enable u make changes to the wrong date of birth. The name on my waec is Celina Peter while the name on my nysc portal and jamb result is Selina Peter, I wnt to do nysc change of date of birth, will I have any issue with it, like will it be approved? U can only change ur date of Birth using the date of Birth in ur waec result, with the help. Of Waec Verification scratch card.